It's good business practice to provide contact information so that buyers can get in touch with you if they have questions or comments about your listings. This tutorial will show you how to add a Contact Us page to your Auctiva Emporium. You can leave any of the fields in this page blank if you prefer not to share this information with buyers. Step 1. Edit your Contact Us page. 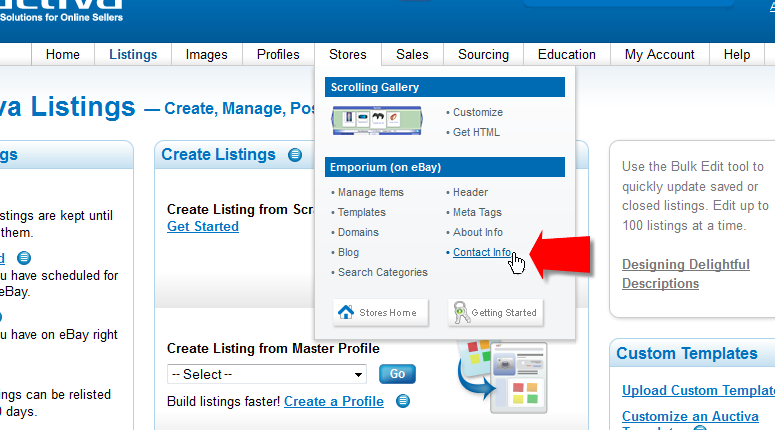 Hover your mouse over the Stores tab and click on the "Contact Info" link (Figure 1.1). Figure 1.1. Go to the Contact Information page. Contact Info: Enter the name of the person that buyers should contact. Day Phone: Enter a phone number where buyers can reach you during the day. Evening Phone: Enter a phone number where buyers can reach you during the evenings. Fax: Enter a fax number where buyers can reach you. Address 1: Enter a mailing address where buyers can reach you. Address 2: Enter a second address line, if necessary. State or Province: Enter your state/province. Postal Code: Enter your postal code. Country: Select your country from the drop-down menu provided. Email Address: Enter an email address where buyers can reach you. Consider setting up an email address that is meant specifically for your business so your personal inbox won't be flooded with inquiries. Doing this also makes you seem more professional to your buyers. Select the checkbox next to "Show your email address to your customers" if you want your customers to see your email address. Select the checkbox next to "Include 'Please add me to your Mailing List' in email form" if you want to give buyers the option of being added to your mailing list. Other Information: Enter any other contact information you want here, such as the best times for buyers to contact you and how long it will take you to respond to inquiries. You could also enter the URL of another website where you list items. 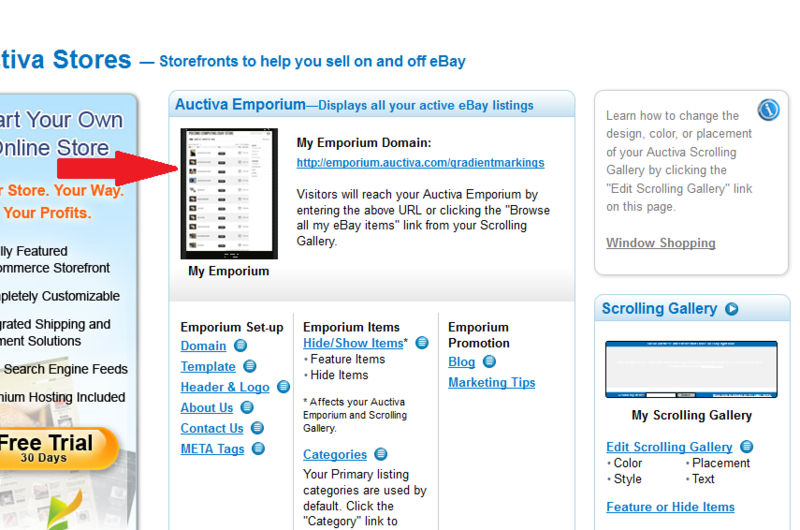 You can view the page once you have chosen an Emporium template by clicking on the Stores tab and then clicking on the Auctiva Emporium thumbnail image in the Auctiva Emporium box (Figure 1.2). Click the "Contact Us" link on your Emporium to view your contact information. Figure 1.2. View your Contact Us page to check for errors. This completes the task of creating a Contact Us page.